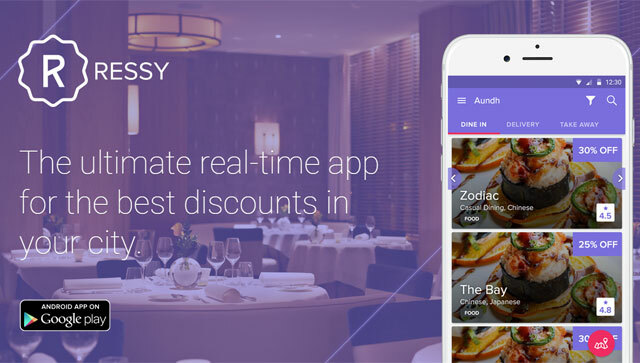 Ressy, an app that provides last-minute deals and discounts at restaurants, has raised $400,000 (Rs 2.5 crore) in seed funding from Eight Capital's founding partner Vikram Chachra and other investors, using the crowd funding platform LetsVenture. Mohandas Pai, chairman of Manipal Global Education and former member of Infosys' board; Akshay Garg, co-founder of Komli Media; Jeljo Joh Kottor, director, ProV Venture Investments (Singapore) and Ketharaman Swaminathan, founder of GTM360 were the other investors to put money in this round. The Pune-based Ressy Technology Pvt Ltd, the firm behind Ressy, will use the money for product development and to bring over 1,000 merchants onto its network, as per a press statement. It will also use the funding to setup a sales and technology team. "I have been on both sides of the table over the last 15 years as a former mobile Internet entrepreneur and an active angel investor. Ressy is one of those ideas that are so strikingly simple and obvious, you wonder why no one else has ever come up with it before. It has the potential to disrupt restaurant pricing models across the world.' Said Vikram Chachra of Eight Capital. Ressy was founded in March 2015 by Sagar Patil and Koustubh Rajepandhare. The mobile app provides up to 50 per cent discount at local restaurants in real-time. The app provides real-time platform discovery, discounts and offers, time bound activations, capacity & inventory management in addition to location specific, time-bound deals. "Ressy's conception came about when, we noticed the prevalent trend within the food and beverage sector, wherein restaurants remained vacant on a few days and saw a surge of customers on few others. We wanted to create an app where the restaurants were able to attract customers when the need arose and be in control," said Rajepandhare. The company has tie ups with over 500 restaurants in Pune. Chachra had previously invested in ventures such as Carwale.com, EzeTap, LetsVenture and OnlineTyari. Eight Capital Advisory Services Pvt Ltd is a private equity fund with approximately $250 million worth of assets under management.